In June of 1986, Joe Longerbeam, who has since passed away, shot a silver-back grizzly bear. This bear has become the famous Grizzly Joe. He earned the respectable title in November of last year (2016) when he was introduced to the NCHS student body at a pep meeting. The student body reacted cheerfully and were quick to fall in love with the bear. Prior to his introduction, Grizzly Joe was taken to two museums in both Colorado and Alabama. Seeing as it was illegal to sell his extinct species, Grizzly Joe was denied by both museums. From that point, Joe Longerbeam’s granddaughter started searching for schools whose mascot was a grizzly bear. She came across Nicholas County High School, the only school in the state with a grizzly mascot. She reached out to Ms. King, who then proceeded to rent a U-Haul truck and travel to Harper’s Ferry, WV, to retrieve Grizzly Joe. Today, Grizzly Joe’s home rests in the heart of Nicholas County High School, where the staff members dress Grizzly Joe up according to seasons and holidays such as Christmas, Thanksgiving, Easter, and so on. Currently, Grizzly Joe is dressed in beautiful Christmas attire, with colorful lights strung around his body and a Santa hat resting on his head. 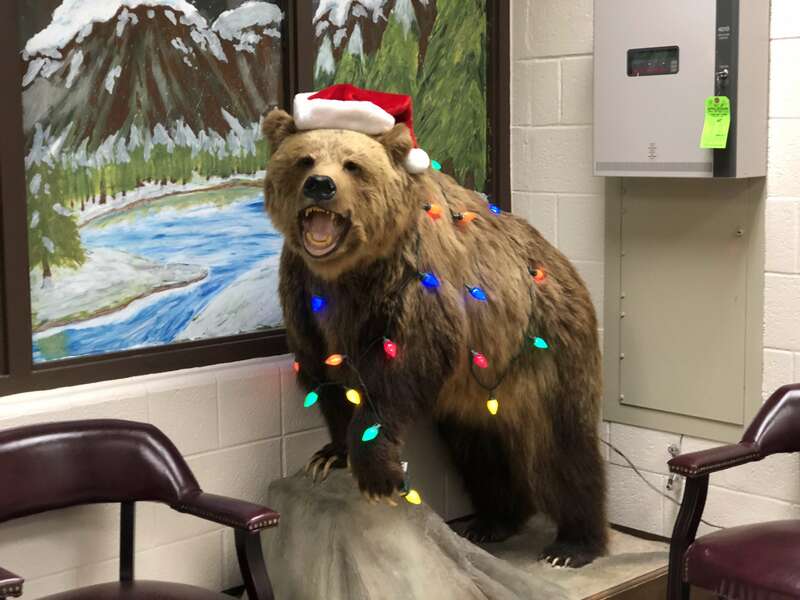 Although Grizzly Joe resides in the front office of the school, his true home is in the hearts of Nicholas County High School’s students and staff. You did a really good job on this website!! !